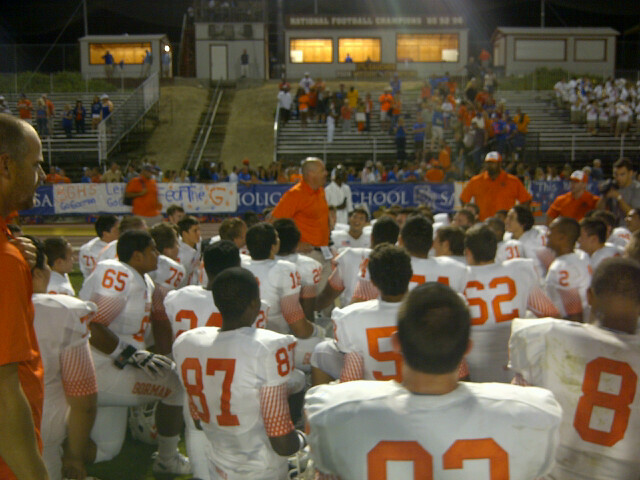 MISSION VIEJO, Calif. – Shortly after Bishop Gorman pulled out a marathon three-and-a-half hour, double overtime 34-31 victory over Santa Margarita here Friday night, a sweat-soaked and exhausted Gaels head coach Tony Sanchez glanced out at the field at Saddleback College here where a few players and coaches were still mingling. Ahmed Ramiz’s 28-yard field goal won it in the second overtime for Bishop Gorman (2-1) but that only begins to tell a small part of the story. * Won despite blowing a 10-point lead in the final 6:25 with the Eagles forcing overtime on a 32-yard field goal by senior Alex Ury with five seconds to go. * Made it to a second overtime even after botching a 37-yard field goal attempt thanks to a bobbled snap on the first possession of overtime. But Santa Margarita (0-2) failed to capitalize when Ury shanked a 42-yard field goal that would have won it. * Ury’s miss came one play after Santa Margarita’s team stormed the field to celebrate after it appeared Grant Clancy had caught a game-winning touchdown pass in the end zone. One official close to the play initially signaled touchdown but a side judge on the far side of the field ruled Clancy had bobbled the ball and never had full control before fumbling out the back of the end zone. After huddling for a few seconds, officials ruled Clancy never had full possession. * Ury then badly missed another 37-yard field goal attempt at the start of the second overtime session to set the stage for Ramiz’s game-winner. Bishop Gorman also survived school-record breaking performances by a pair of outstanding Santa Margarita underclass prospects you’ll no doubt be hearing a lot more about in the coming years, 6-foot-4 sophomore quarterback KJ Costello and explosive 6-foot junior wide receiver Kyle Sweet. Sweet tied the Santa Margarita record for receptions (14) set by longtime NFL wide receiver Brian Finneran and finished with a school record 300 receiving yards. Costello, who threw lasers all over the field despite being harassed by a strong Gaels’ pass rush, completed 25-of-41 passes for 439 yards, four touchdowns and two interceptions. That shattered the school’s single-game passing mark of 413 yards set by 2002 Heisman Trophy winner Carson Palmer, now the quarterback of the Arizona Cardinals. The Gaels also had their share of heroes. Senior quarterback Randall Cunningham II completed 14-of-24 passes for 191 yards and a touchdown and also rushed for a team-best 114 yards on 22 carries while senior running back Daniel Stewart added 91 hard-earned yards and a touchdown on 24 carries. Blossoming junior tight end prospect Alize Jones caught six passes for 59 yards while Obim Okeke caught three passes for 85 yards, including a 53-yard touchdown reception. And senior cornerback Dylan Weldon returned an interception 41-yards for a touchdown and also had a huge deflection in the end zone with 13 seconds left in regulation on a well-thrown pass from Costello to a diving Sweet. The Gaels return home on Friday night to host another southern California prep heavyweight, Crespi High of Encino.